iVisor Glass Privacy goes beyond protecting your precious Apple iPhone 6 touchscreen, it also safeguards sensitive on-screen content from prying eyes. Now you can enjoy greater privacy while using your Apple iPhone at work, home, or in public places. Thanks to a proprietary multi-layered coating, iVisor Glass Privacy offers a crystal clear view when looking straight-on at your Apple iPhone while preventing others from seeing your screen when viewed at a side angle. Its substrate glass is made with atomically-strengthened Ion Glass that offers unrivaled scratch-resistance and touch sensitivity. 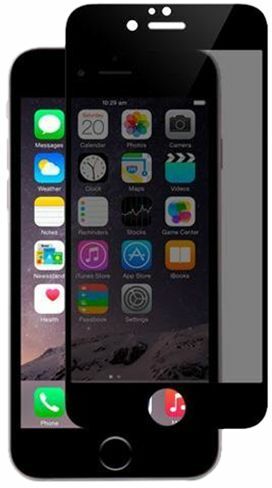 As the only privacy glass screen protector that offers true edge-to-edge screen protection.